In the heat of a swordfight, the last thing you want to worry about is the loss of a hand! That is why you should equip yourself with the stylish Black Chevron Leather Bracers. 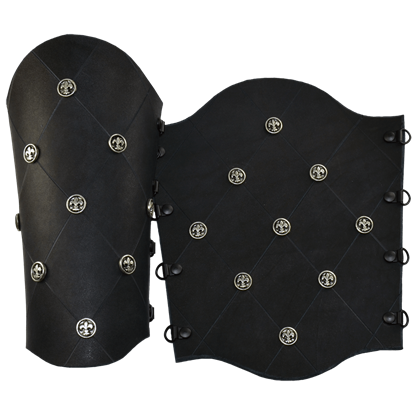 These versatile vambraces are sure to keep your forearms safe from harm. Their sleek, durable forms have a stitched chevron pattern with inset, steel tone metallic studs. 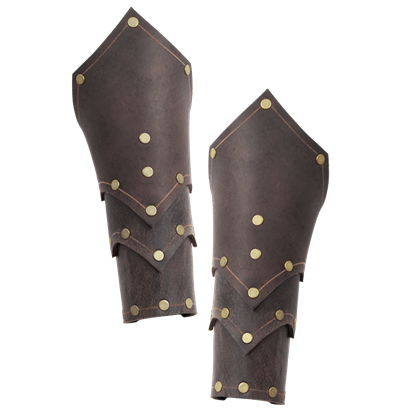 The stitched pattern adds extra style to the medieval leather bracers, making them both unique and versatile additions to armour outfits. 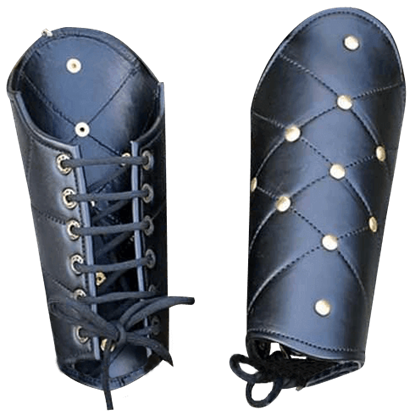 The bracers are sold as a pair and lace up the back, making them adjustable and easy to wear. Great for costuming, reenactment, LARP, and more, the Black Chevron Leather Bracers offer protection along with just the right amount of style. This item is handmade, the measurements may vary slightly. No matter how strong your sword fighting skills are, if your enemy lands just one blow to your forearms, you are done for! 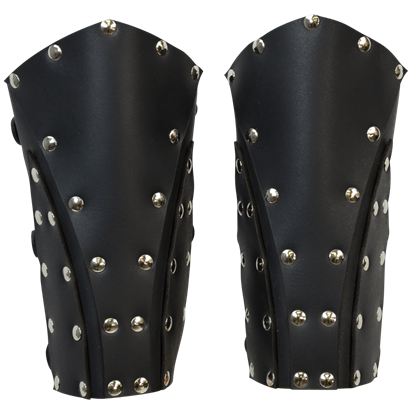 Make sure you are adequately protected by equipping yourself with the Black Studded Chevron Leather Bracers. This bracer is crafted from 7/8 oz. leather that has been cut to an appealing shape and studded with several rivets along the edge. 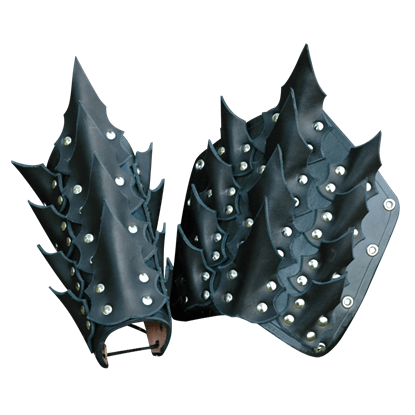 The bracer also features sweeping points at the top and bottom that makes for a very attractive look. When a rogue needs armor, it needs to be flexible and supple enough to move and shift, and it absolutely must NOT hinder the wearer. 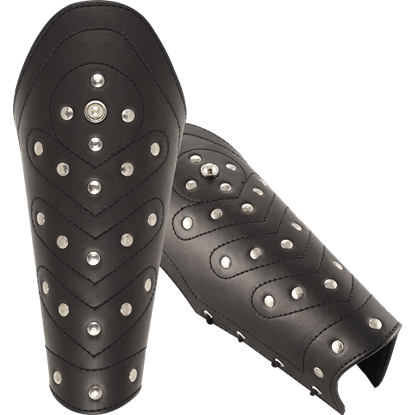 These Dark Rogue Leather Bracers not only look great but also offers great protection too. 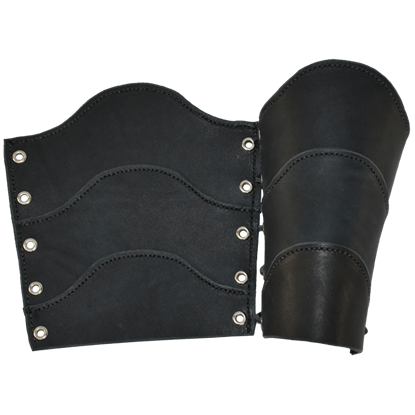 Our Classic Warrior Leather Arm Bracers combine a flattering shape with comfort and functionality. With three segments that are sewn together, the gentle curves on each segment creates a wonderful look when the bracer is laced up. The Fleur de Lis is a common symbol from the Middle Ages. It is most frequently associated with nobility, oftentimes French nobility. The Classic Fleur de Lis Bracers are not for nobility only, though. They are suitable for anyone. These three dimensional bracers will definitely make a statement and add a sense of darkness to your look. There are three rows of sharp looking dragon scales with the center row scales being slightly larger than the outside rows.